Mount Southington Ski Area—Located just off Exit 30 on I-84, Mount Southington offers terrain for all members of the family—from the most experienced skier to the toddler just finding her mountain legs. In addition to providing an evenly distributed range of terrain, they offer weekly children’s programs to foster a fun and nourishing environment for those just starting out. Their longest trail is almost a mile long, the snowmaking machines supplement the entire mountain, and their seven lifts will get you to the peak in no time at all. 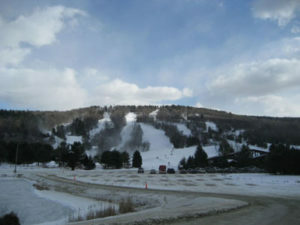 Mohawk Mountain—Mohawk is one of the most underrated ski resorts in the state. Their Snowsports program has offerings for every age and every level, and a Yeti mascot has been known to make appearances throughout the season. In addition to providing a local, down-to-earth ski environment, they offer night skiing nearly every evening of the week. They also offer discounts on bulk ticket purchases, seasonal rentals, and competitively-priced seasons passes. Ski Sundown—Founded in 1964, Ski Sundown comes from humble roots. At its beginning, three slopes, one mile-long trail, and two lifts comprised what is now a massive enterprise. The resort includes family-friendly trails, a massive base lodge, and a vast range of ski school offerings. It has also set a number of records in the state of Connecticut; it had the state’s first terrain park installed in 2003, launched one of the first adaptive ski school programs in the area, and has the state’s steepest trail—Satan’s Stairway, one of the most challenging mogul runs in Southern New England. Woodbury Ski Area—Skiing, snowboarding, tubing, and racing—Woodbury Ski Area has it all. They are one of the first areas to open and one of the last to close during the season. With 100% snowmaking, they are often open from late October to mid/late April. For those wanting an adrenaline rush, their quarter pipe is one of the best around, and slalom routes are often set up throughout the mountain. Bring the family for a day of fun and adventure.